The project “The cultural code of Pokrovsk” will be presented at the municipal Pokrovsk history museum (Pokrovsk, Donetsk region, Yevropeiska str. 22) on February 18 at 13:00. It is implemented in the framework of the project “Under construction: Museum open III” run by Ukraine Crisis Media Center with the support of the United States Agency for International Development (USAID). At the opening a renovated exposition hall will be presented. Entitled “How the city emerged and its society and economy grew in the late 19thcentury – in early 1940s” the hall is thought to be a comfortable and attractive leisure and cultural place for visitors also enhancing their creative skills. An excursion will be held for visitors accompanied by music. 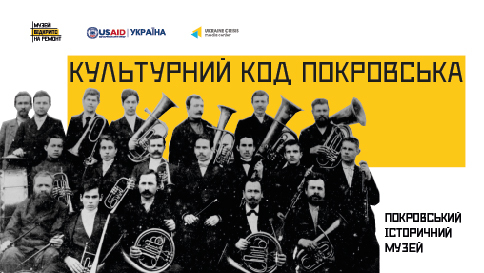 At the opening the internationally renowned “Shchedryk” song by Mykola Leontovych will be performed by a student of the music school named after Leontovych. Poet Lyubov Chorna, awarded member of several Ukrainian literary organizations, will read her poetry dedicated to Mykola Leontovych. A video called “Mykola Leontovych’s life in Hryshyn” will be demonstrated to the visitors. Project organizers will also launch the anti-vandalism campaign “Let’s save Leontovych’s heritage” and will start filling out the album “The cultural code of Pokrovsk”. Speakers: deputy mayor of Pokrovsk; poet Lyubov Chorna, member of all-Ukrainian creative union “Congress of Ukraine’s writers”, member of NGO “Creative union Sutsvittya” (flowering); awardee of Slobozhanshyna (geographic area) literary-artistic award named after Mykhailo Petrenko; representative of the museum’s volunteer movement. “The cultural code of Pokrovsk” project was implemented not only with efforts of the museum staff but also with those of the city’s artistic community, volunteers of the Pokrovsk history museum, personnel of the Mykola Leontovych music school and by the department of culture, tourism and cultural heritage protection at the Pokrovsk city council. Press contact: Angelina Rozhkova, museum director: 050-217-69-78 and Olha Honchar, PR consultant at the “Under construction: Museum open” project: +38 093 339 76 46.